The Flathead River is our home river - its waters come from the pure meltwaters of Glacier National Park and the Bob Marshall Wilderness. 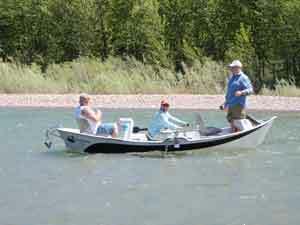 We fish the main stem of the Flathead River, just outside of Glacier Park, from the comfort of drift boats. The Flathead River is an awesome fishery that is still relatively undiscovered. It is home to the native Westslope Cutthroat trout, known for it's insatiable appetite and willingness to feed on the surface. Since a catch-and-release policy was mandated in 1998, we have been enjoying the increase in the number of larger fish. These factors make this a very good place to learn to fly fish. Montana's Flathead River offers spectacular scenery and excellent dry fly trout fishing throughout the summer and fall. The Flathead is a large river with flows up to 20,000 cubic feet per second early in the season. 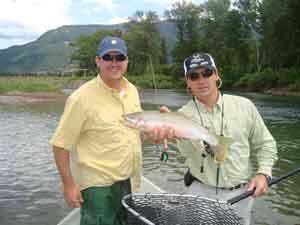 In Flathead Valley Montana, you will have the opportunity to fish for a native fish in a beautiful setting.